Darts help to create the desired shape of the clothing items. In addition to a constructive purpose they can be used as decorative items, especially in women's and children's clothing. Darts can be split (Fig. 466 a), and continuous (Fig. 466 b) or into folds (Fig. 466). When nemelka uncut tucks outlining the middle line of tuck and one of its sides. The Darts that go into the folds, further outline a transverse line perpendicular to the midline. First tuck smatyvay. Stitching tucks performed by one of these parties, Darts, bending the part on the centerline of the tuck. In the processing of the uncut tucks if stitching by stitching throughout the length of the pull strip from a primary or a cotton fabric (Fig. 467 a), positioning it so that it is performed at 1-2 cm in the lower end of the tuck; in the treatment with split - stripes enclose only in their tips (Fig. 467 b). Seam stitching at the ends of the Darts negated. Single layer strips of fabric at the end of the Darts cut to the lines of the piecing together and laid out on two sides. Tuck into a unilateral folds, first sew across the seam allowance at the dart, then on the side, gradually reducing the seam towards the end for no (Fig. 467). Tuck, passing into inverted pleats, and sew, starting from the transverse lines (Fig. 467 g). Depending on the style these Darts can be crafted with fabric or without it. Stefannie tuck moisturize and aligning the seams, Ironing to remove moisture from fabric. While tuck, stefannie with strips of cloth rautureau, with allowances tucks in one side of the seam stitching, and prilocaine strips in another. 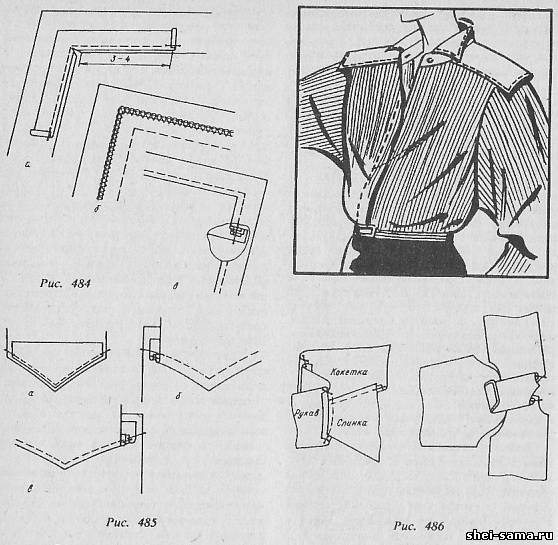 Cut tuck depending on the style rautureau or iron on the side. The resulting slack of the fabric in the ends of the Darts sativum. and Finishing unilateral - box pleats, jotted along the length of the entire part. The folds on parts lay along the planned lines, smatyvay and zastrugivajut, one-sided folds (Fig. 468 a) straighten and priorivet, by bending in one direction or another according to the model. Box pleats (Fig. 468 b) priorivet, ratatuia the seams of the piecing together and placing them in the middle of the folds. Finishing one-sided and inverted pleats, jotted on one piece of fabric to end of part. Detail of the product in the intended bend on the wrong side of the line, folding it inside out, and smatyvay zastrugivajut crease to markup, defining its length. At the end of the unilateral allowance folds in the crease zastrugivajut in the transverse direction in a straight line or oval (Fig. 469). Allowance for the pleat bent in the direction according to the model and priorivet. Inverted pleats rautureau, distributing the allowance in the crease on either side of the stitching in stitching the pleats. To inverted pleats does not shift during wear of the product, the allowances in the crease zastrugivajut on the reverse side (Fig. 470) or the front of the line, across the seam allowance on the fold and fastening the whole width of the folds (Fig. 471). Finishing one-sided and inverted pleats, stitched on to an integral part. Detail products bend, forming a fold, and is planned for the front side lines namachivajut and scribbled folds (Fig. 472). Connecting one-sided and inverted pleats, zastrochennye not until the end of the part. In the processing of unilateral folds of the folded part, right sides inside, and sew smatyvay on the planned line, ending line across the allowance for the fold (Fig. 473). The edges of allowances on the crease to grind, and then overcast the edges. 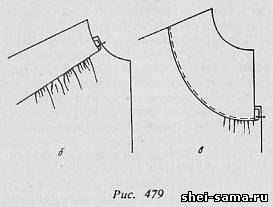 In the processing of counter-pleats fold the details right sides inside, smatyvay on the planned lines and grind off, clipping the end of the double reverse stitching (Fig. 474). Seam stitching details rautureau, soutourina allowances on the crease. In the folds with additional detail throughout the length of the crease or just under destacando part of the allowances on the pleat fold with additional detail, right sides inside, and sew smatyvay, and then slices overcast (Fig. 475, 476). The upper section further details a previously overcast. Allowances in the crease for more detail straighten and fasten stitching. The line lay across the face of the main parts and features across the folds. The coupling of unilateral and counter nastronie folds. Stock on the crease bend according to the planned lines inside out and pritozeval. In the processing of unilateral folds (Fig. 477) detail with the press edge is applied to different part according to a pre-planned line, namachivajut and scribbled. 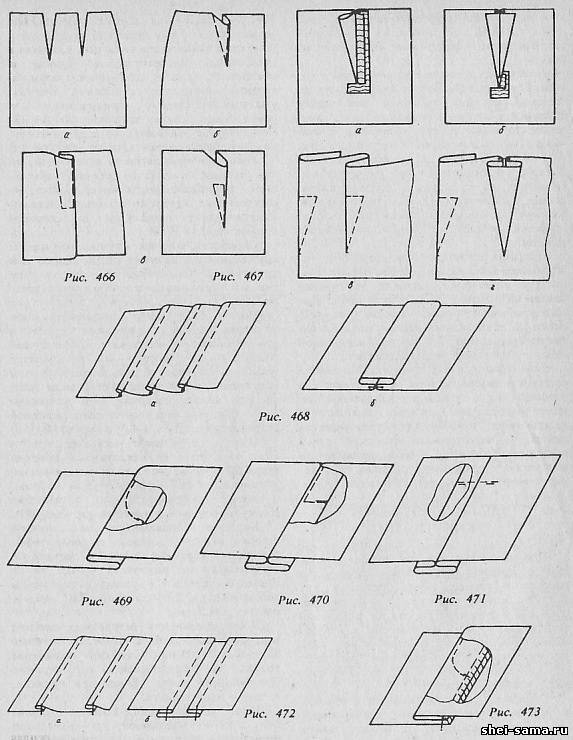 When processing counter-folds items with press the edges impose additional detail on the planned line, namachivajut according to the markings and scribbled (Fig.478). Slices allowances in the crease in a one-sided folds, cuts allowances in the crease and cuts the extra parts in opposite folds metiaut, grind, then overcast. When you upgrade products are widely used yoke. You can insert them on the shelf and the back, skirt, trousers, etc. of the Basque come in many different shapes: straight, oval and curved. According to the method of connection of the yoke can be stitched and patch. The lower edge of the yoke may be deaf (Fig. 479 a) and escape (Fig. 480) banding (Fig. 481), frill (Fig. 482), flounce, lace. Treatment banded flirts with a straight and an oval lower edge. For the main part, depending on the model can be formed by assembling or crease (Fig. 479 b). The Assembly of items is distributed evenly across the province or in certain areas depending on the model. Folds lay on the planned lines and zametyvayut. The yoke is folded with the main detail right sides inside, equalizing sections, primetyvajut and pritachivajut seam width 1-1,5 see perform Primaqiune from the yoke. Seam primaqiune yoke overcast. If the seam primaqiune nastroni, it is bent in the direction of coquette, zametyvayut, priorivet and scribbled at the distance prescribed by the model. Nastraivanie performed on the front side (Fig. 479). Processing coquettes edging frill and lace. In the presence of edging, frills or lace in the seam primaqiune coquette first pritachivajut these finishing details to the yoke (Fig. 481, 482). Stripe for the edging fold in half wrong side inside, stack the slices and priorivet. The prepared strip is applied to the front side yoke fold to the middle of the part primetyvajut and pritachivajut Kant on the distance from the bend strips equal to the width of the edging. The width of the seam from the side of the main part should be 1-1,5 cm (Fig. 481). Frill pritachivajut as well as Kant, with its applied face down on the front side of the yoke, equating slices cut with ruffles coquette, and primetyvajut on the frill, a dispensing Assembly evenly, and pritachivajut (Fig. 482). After connecting and finishing of the parts the yoke is folded with the main detail right sides inside, equalizing sections, and primetyvajut on the line of primaqiune Kant, ruffles or lace, and then pritachivajut. If the seam joining the Basque with the basic detail nastroni, the sections were pre-seam zametyvayut, priorivet and scribbled on the front side at a distance prescribed by the model. Processing invoices flirts with straight and oval edges. The yoke with a straight edge outline line of bending, and basic details line the edges of the yoke. Cut yoke bend towards the inside on the planned line, zametyvayut and priorivet. The yoke is applied to the main item, combining it with the bent edge of the planned line on the main part, and namachivajut, and then scribbled at the distance prescribed by the model. The seam joining the Basque with the basic detail overcast and priorivet. Processing invoices flirts with scalloped edges. When processing flirts with protruding corners on the front outline the line of bending region. If the model yoke must be attached to the main part of the narrow finishing line (about 0.1-0.5 cm), the edge of it along the lines bend towards the inside, in the corners of the lay so that the slices were not visible from the front side, zametyvayut and priorivet. When nastraivanii yoke to main detail wide decorative stitching corners of the yoke grind off (Fig. 483). Joint width 0.5 cm, rautureau seams, corners straighten, turn and priorivet. On the main details of the schedule line the edge of the yoke. Processed the yoke is applied on the front side details, combining the processed edge from the intended line on the main part, and namachivajut at a distance depending on the width of the finishing stitches. The yoke scribbled on the front side and priorivet. Processing flirts with inside corners when connecting them to the part. For processing the inner corners of the yoke cut out the facing from the core material the shape of the corner with a width of 2.5-3 cm On the underside of the yoke outline of the line the desired shape. The facing is applied to the underside of the yoke face up primetyvajut and pritachivajut on the planned line (Fig. 484 a). The seam in the corner of the cut before reaching the line of 0.1, see the Details laid out in different directions, the seam and iron are bent in the direction of the piping.The yoke is folded with the main detail right sides inside, equalizing area the primary area of the piping of the yoke, primetyvajut on the planned line angle (Fig. 484 b) and grind off, while a place in the area should take place strictly on the line of primaqiune piping. The excess suture cut, leaving a seam allowance of at least 1.5 cm Slices overcast and iron. When processing flirts with inside corners when connecting them with the main part of the overlay weld to the upper sections details are given allowance for ACC. Its magnitude depends on the width of the finishing stitches felling of one part to another and equal to the width of the finishing stitches plus 1-1,5 cm In the inner corners of the seam allowance netscout on the width of the ACC. For processing the inner corner cut out the facing from the core material in accordance with the shape of the processed corner.The facing applied to the front side parts having outer corner, namachivajut to the underside of the main part strictly on the intended line and pritachivajut. The seam in the corner of the cut before reaching the line of 0.1 cm, the facing turned inside out the main parts, the seam is aligned and priorivet, positioning it in the crook or releasing, edge width 0.1 cm in the direction of the piping. The yoke is applied to another part (Fig. 484), combining the edges are trimmed angle with the intended line on the main part, and scribbled the finishing line at the distance prescribed by the model. Coquette, with a complex, scalloped edge, can connect with the basic details of narrow or wide decorative stitching. When connecting the narrow finishing line scalloped-edge yoke bend towards the inside on the planned line and zametyvayut. In order to avoid delaying the edge of the swept cut in several places netscout, not reaching 0.1 cm to stitch zamatyvala. Swept the region priorivet. After that the yoke is applied to the main item, combining the bent edge from the intended line on the main part namachivajut and scribbled at a distance of 0.1-0.3 cm (depending on model). To handle the yoke with a complex, scalloped edge, cut out the facing in the form of a yoke of length equal to the length of the workpiece edge, and a width of 3-5 cm (depending on the width of the finishing stitches). The inner edge of the piping may be straight or curly. The direction of the warp threads in the facing should match the direction of the warp of the workpiece. The inner section of piping overcast. The facing applied to the front side of the workpiece face down, equalizing sections, namachivajut from the piping and grind (Fig. 485 a). Joint width 0.5 cmIn order to avoid delaying the edges of the cut seam in several places netscout, not reaching to line 0.1-0.2, see the Facing folded to the underside of the workpiece, the seam straightened and spawn, forming, edging to the side of the piping with a width of 0.1-0.2 cm and priorivet. After that the yoke is applied to the main item, combining the processed edge from the intended line on the main part, namachivajut and scribbled the finishing line at the distance prescribed by the model (Fig.485 b, C). Seam priorivet. Flirty, televitrina on shoulders, unfastened sleeve. Part of the coquette passing to the sleeve (Fig. 486), grind from the bottom yoke seam with the width of 0,5-0,7 see the Yoke turn on the front side, straighten the seam and spawn. Seam grinding from the yoke netscout to connect it with the shelf and back. From the notch on the bottom of the yoke leave allowance of 1-1,5 cm on the seam of the connection of the lower part of the yoke sleeve. The yoke is folded with the shelves and backs, right sides inside, and sew smatyvay seam width 0.7-1 cm, not reaching the armhole to the seam width of vrachevanie sleeves. Seams depending on the model rautureau or iron.